NOCSAE sets performance and test standards for athletic equipment. NOCSAE does not certify or approve athletic equipment. Safety Equipment Institute (SEI) oversees the certification of athletic equipment to NOCSAE standards. 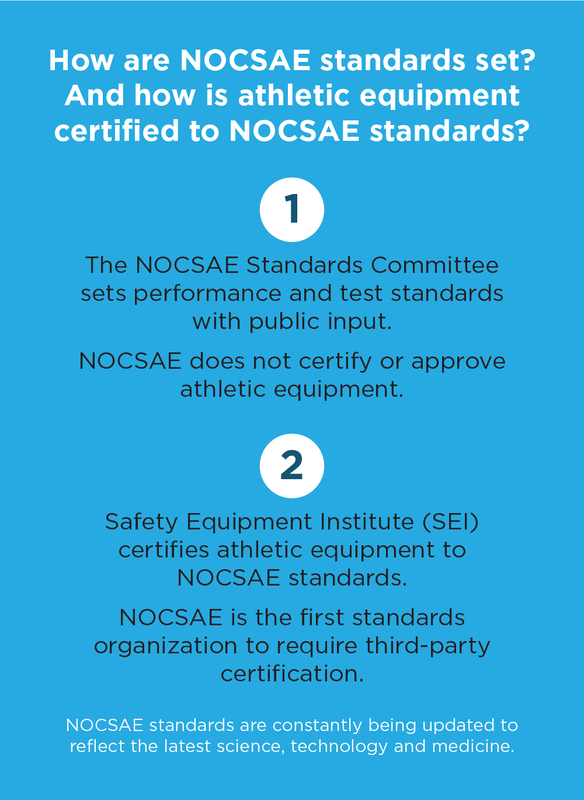 In 2015, NOCSAE began requiring third-party certification of compliance with NOCSAE standards. Third-party certification enhances the integrity of all NOCSAE standards, giving athletes confidence that their athletic equipment has been tested by a neutral, independent body to meet the highest performance standards. This is the most stringent and unbiased way to determine standards compliance, as the third party cannot have any connection to manufacturers or products they certify. NOCSAE is the only athletic equipment standards development organization that mandates independent third-party certification of compliance, in accordance with ANSI/ISO 17065 international guidelines. NOCSAE has designated Safety Equipment Institute (SEI) as the certifying body for this purpose. SEI is an independent, ANSI/ISO 17065 accredited, certifying body that specializes in personal protective equipment. Learn more at the SEI website: www.seinet.org. Manufacturers are solely responsible for product warranties. NOCSAE is not involved. Both the manufacturer and SEI as the certifying body have the right, under the NOCSAE standards, to declare a certification void if the certified product is altered after certification and made available for sale. A model is certified in the condition and configuration it is offered for sale to the public. An alteration or addition to that configuration after sale may change the performance characteristics. Manufacturers seeking to certify their products to NOCSAE standards will need to submit necessary testing fees, product testing samples, product labels, quality program manuals and other required materials to SEI. Manufacturers also will participate in a quality audit and review protocols for responding to customer complaints regarding product performance. The work of establishing a football helmet standard begun in 1970. 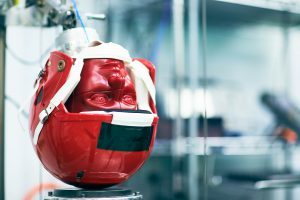 A test system was designed featuring a humanoid head instrumented to determine the degree of hazard experienced by the model relative to a severe brain injury criterion in football impact simulation. The NOCSAE test standard was published in 1973. Voluntary changes which have occurred in football helmet design include shell size changes, substitution of stiffer for softer materials, and more space for softer materials. Manufacturers immediately began making helmets that would pass the test standards. Every player participating under either NCAA or National Federation football rules must wear a helmet in which the seal “Meets NOCSAE Standard” is permanently stamped on the outside rear portion of the helmet. The NOCSAE Baseball Batting Helmet Standard was published in 1981. It was designated as the baseball/softball batting helmet standard in 1983. Again, manufacturers began making helmets which met the test standards. Beginning with the 1985 season, the NCAA and NFHS baseball rules, as well as most youth play organizations such as Little League, USA Baseball, ASA, and others, required the use of helmets which met the NOCSAE standard. The NFHS softball rules also required certified batting helmets beginning with the 1985 season. A consumer can readily identify certified helmets, as the seal “Meets NOCSAE Standard” is permanently stamped on the rear portion of each helmet. The standard for lacrosse helmets and face masks was published by NOCSAE in 1986.